Page Jump: ========== 1 - Introduction 2 - State of play 3 - Westmere vs. Nehalem 4 - Fusion first 5 - Mid-range under attack 6 - Clarkdale, Arrandale, Core i3. Core i5, Core i7 - help 7 - The all-new Intel HD Graphics 8 - Intel Core i5 661 9 - But what about the chipset? 10 - Intel H55 Tom Cove 11 - P7H57D-V EVO 12 - So what does Westmere bring to the mainstream table? Intel is a company that makes computer chips. Millions upon millions of computer chips that end up powering the vast majority of server, desktop, and mobile machines sold today. Intel also likes to be in total control of the entire chip-making process, from design to manufacturing, and is willing and able to spend billions of dollars a year in pursuit of this goal. This is why when the firm releases a product roadmap, the overwhelming probability is that the PowerPoint will turn into reality - give a quarter here or there. The top-level roadmap is detailed in clock-like parlance. 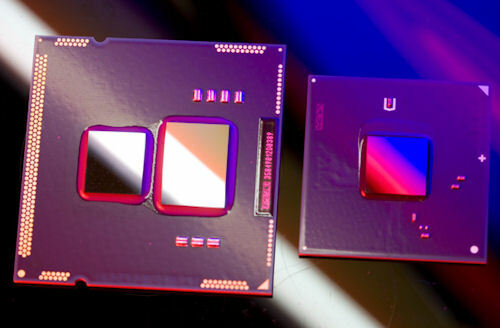 Following a tick-tock philosophy, the chip giant is promising to introduce a new silicon process in one year and follow it up with a brand-new architecture the next year, based on the incumbent process. 2009 was, broadly speaking, the 'tock', as the potent 45nm Nehalem architecture pervaded the server and desktop markets under the Xeon 5500-series and Core i5/i7 brands, respectively. Sticking to schedule and delivering the 'tick' - a process reduction along with minor refinements - Intel is introducing 17 new chips based on the 32nm Westmere architecture. Westmere is more than just a die-shrink, however, as it enables Intel to do meld the CPU and GPU on to one package. The bevy of new processors and new chipsets will power most mainstream PCs and notebooks this year, so it really is worth your while seeing what makes them tick along. Read on to find out.